One of Monet’s interests, in addition to painting and gardening, was collecting Japanese art. His home had 231 Japanese woodblocks, Hokusai being prominent among them. Many of Hokusai’s paintings were primarily landscapes. Most would contain figures but the figures were not the focus of the paintings, rather they were an addition to it. A good example of this is Aoigaoka Waterfall in the Eastern Capital. Hokusai’s Japanese flower concentration may have been a factor in Monet’s realization that his water lilies would be a fantastic subject for a painting. Hokusai’s flowers did not need landscape as background to make them beautiful. Monet would blend this with his love of the sea to eventually create paintings of only his water lilies and the water. 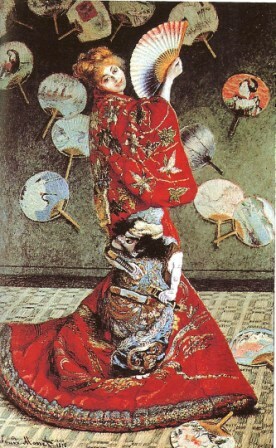 The most obvious and indisputable proof of Monet being influenced by the art and culture of Japan is his work, Madame Monet en Costume Japonais (La Japonaise). Camille Doncieux poses in an elaborate kimono and the background shows many fans. Her hair is painted as blonde to emphasize the fact that she is a westerner and her skin is incredibly white, an imitation of the white geisha’s face. It could be a commentary on Paris’ obsession with all things Japanese. Later on Monet would regard this painting as trash.